Miss Stalin just turned two yesterday and she is totally enamored with all things Minnie Mouse. She calls her Meanie and has PJ’s, shirts, and even a little stuffed animal of her. She loves them all! 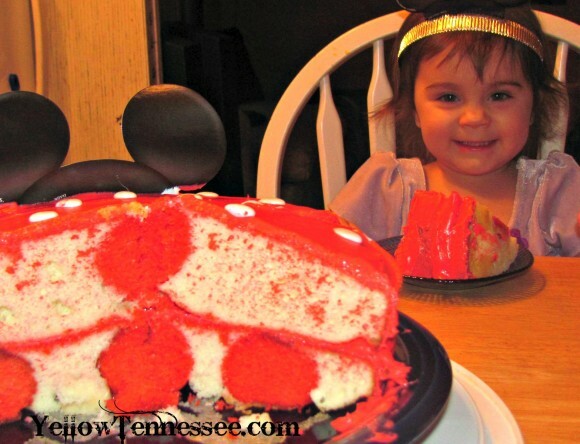 So for her birthday I wanted to make her a Minnie Mouse cake. Now I made a cake for the first 5 years of Genghis’s life. Everything from simple cupcakes to a dinosaur that looked more like a dog and even a Lego cake. Some were better than others. None of them were outstanding. But I always tried. So this year I started asking around for ways to accomplish what I had in my head. 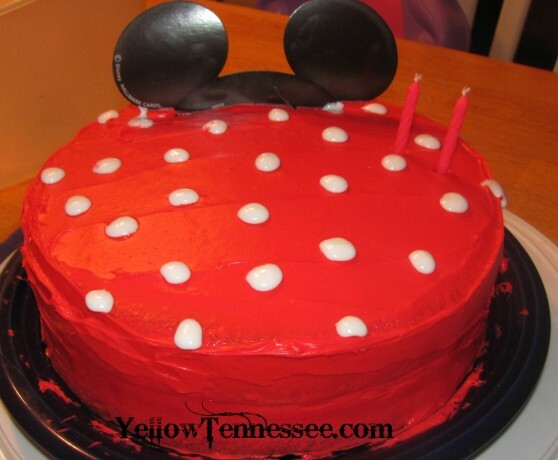 I wanted just a simple round cake but I wanted it to have polka dots just like Minnie’s dress. Easy enough, right? I asked around some amazing baking bloggers I know and Cat from Food Family and Finds let me know that it could be done and she shared this link. Then I got to work. I actually made the inside of the cake reverse the outside. I only did this because I didn’t want the bulk of the cake to be made with red food coloring. And because I like to bake but am not great at it, I simply used cake mix and premade icing to make this. First up I made the cake balls following the instructions with the Cake Pop pan. Increase the egg by one, use milk instead of water and only half the amount, and add one package of pudding. I also added lots of red food coloring. The trick comes in cooking them so they hold their shape but are not all the way done. For me that was about 18 minutes. After the cake balls were cooled I made the white cake mix according to the directions. Then I added the cake balls to the pan and poured the batter over them. I only used one box of cake mix but next time I will use two. It worked this way but some of the cake balls were taller than the actual cake. Once cooked, I let the cake layers cool. 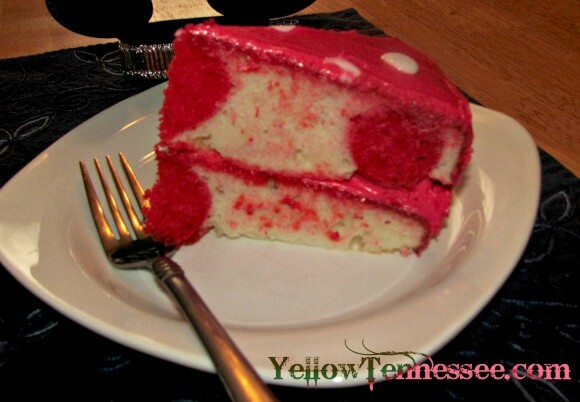 Then I used Wilton icing dye and colored my white icing red. I iced the entire cake with the red icing and then used cookie icing in a tube to make the white dots. I found some paper mouse ears and used those on the cake. Miss Stalin knew immediately who the cake was supposed to be. Do you make character cakes for birthdays?